First off, let me start by saying I’m an introvert and I’m not much of a “joiner.” Groups and clubs and social circles are not really my thing. Hell, half the reason I shoot at night is to simply get away from all the people. That said, having a group of photographers around you to discuss ideas and help you grow is a valuable thing for anyone looking to get better. We often have this as students, but as adults this can be harder to achieve. This weekend was the opening of a group show arranged by the organizer of a local group of photographers that I belong to. 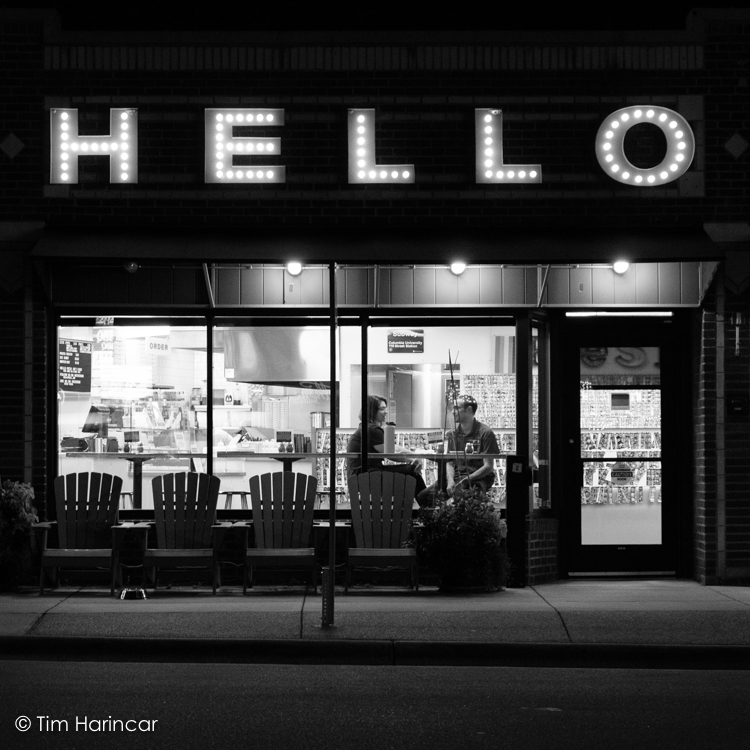 Called FStop, this “anyone-can-join” group meets monthly at the Minneapolis Photo Center. Usually, each month will draw 40-50 people to hear 4 photographers present their work to the group. I started attending this group about a year ago. I knew about the photo center, so on a whim I went up there, paid my $10 (to cover some food that is laid out and use of the space) and just listened. I listened to the other members talk to each other, I listened to the folks presenting their images, I introduced myself to a couple of people near me and listened to them share the kinds of projects they were doing. We present in analog, which I love. The photographers bring and hang unframed prints - there is no projector. Is this limiting? Perhaps. It is possible that someone would like to present their work who could not afford to make prints. I think if there were such a person and they make their situation known they could get a limited set of prints made with help from some other members and the photo center. But for me, printing is part of the final photographic process. I will probably do a whole future post just on printing, but to me there is a lot of decision making that happens during the print process. If you think you’re going to sell images or put them in a museum or show, you better learn how to print and figure that part out. It gives members an opportunity to walk up to an image and examine it, so see it close and in context of the others around it. So for this group it makes a lot of sense to talk about printed images. FStop, like I suspect similar groups in other cities, attracts a wide range of photographers, some professional, some not, and most working on some kind of fine art project. That’s not to say someone shooting sports or products wouldn’t be welcomed or encouraged to share their work. It just seems like this group has mostly art photographers of one stripe or other. Several members have had shows either at the center or other places around town, quite a few have images in museums and other collections. It’s a solid group of experienced photographers that have been around. Every year in the fall the group does a show, anyone can submit images and the organizers will include one. So it’s a little like “open-mic” night, in that everyone gets a turn, but it’s a still chance to go through the process of selecting images to submit and then printing and framing, even if it isn’t quite as cool as having your work recognized and invited to a more traditional group show. The theme for the show this year is “America Now”, whatever that means to us as photographers. We were to submit up to three shots each, and the one of mine that was selected was not really the one I expected. Which is fine, and also interesting. I had expected one that was a little more obvious of the time and space that we live in. 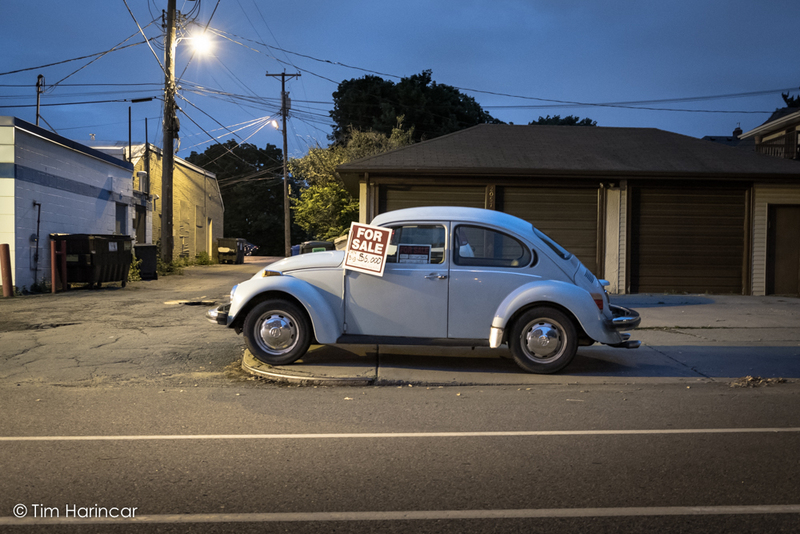 The one that was chosen was one I shot of a classic VW Beetle for sale. I go back and forth with this image. Sometimes I really like it in this weird sort of minimalistic way, same as I do with Stephen Shore photographs. Other times I think it’s boring. But hey, I don’t have to explain it. People can read into it. People can tell *me* why they think it fits (or doesn’t) in the show. The show opened a couple of days ago, and it was a nice evening. There were actually two shows opening the same evening at the center (this was intentional) and together they brought a really good turnout. I stopped by and stayed for about an hour, going around and looking at most of the photos twice. There was a lot of quality work presented. I don’t know where mine fell on the spectrum, except it wasn’t the best. I’ll let others judge it’s merit (or not). In the end, it’s the effort that is important in getting a print on the wall. That, and being part of a group of people that are doing quality work that can serve as a much more positive feedback and inspiration network than social media.